At the end of the 8.5 hour chess day, two champions were crowned. 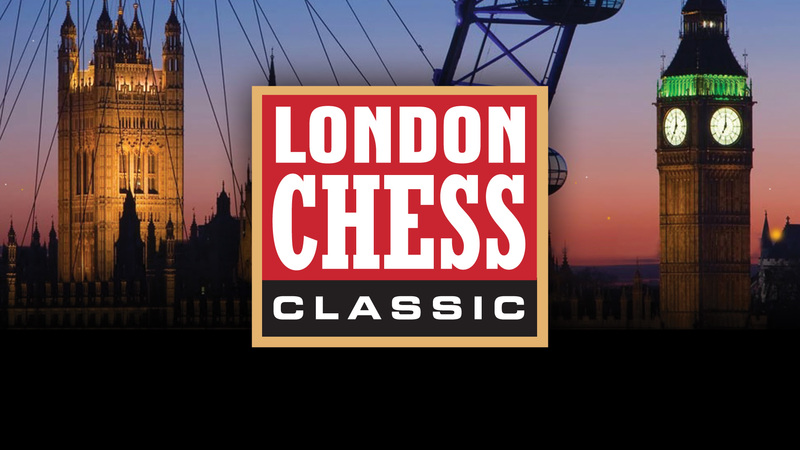 In a dramatic finale, Fabiano Caruana defeated Ian Nepomniachtchi in the second blitz game of the playoffs to win the 2017 London Chess Classic. After several misses both in the rapids and the first blitz game, he emerged victorious in the time scramble. 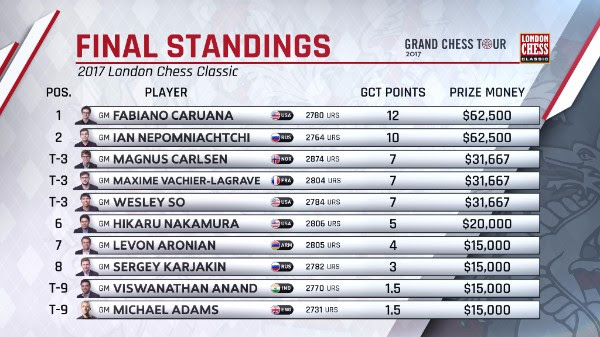 The playoffs came half an hour after Caruana’s six-hour grind against Michael Adams. 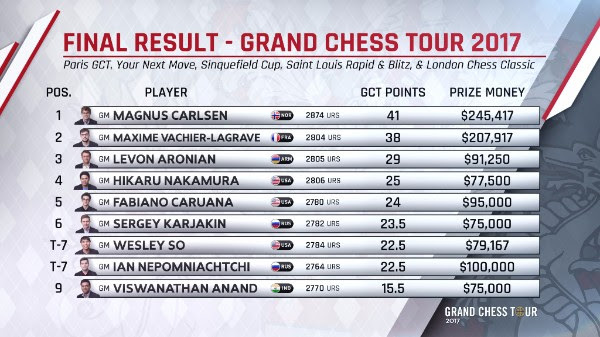 This is the first Grand Chess Tour victory for the American. The overall winner of the 2017 Grand Chess Tour was none other than World Champion Magnus Carlsen, who won a clutch game with black pieces against Levon Aronian. This is his second Grand Chess Tour win. Entering the round with a half point lead on the field, Nepomniachtchi felt that the most important thing is not to lose. He made a very easy with a threefold repetition, ending the game in 19 moves. This gave him the opportunity to relax and wait for the potential tiebreak in case Caruana won his game. Nepomniachtchi explained that it wasn’t his proudest decision, but it was a practical one. 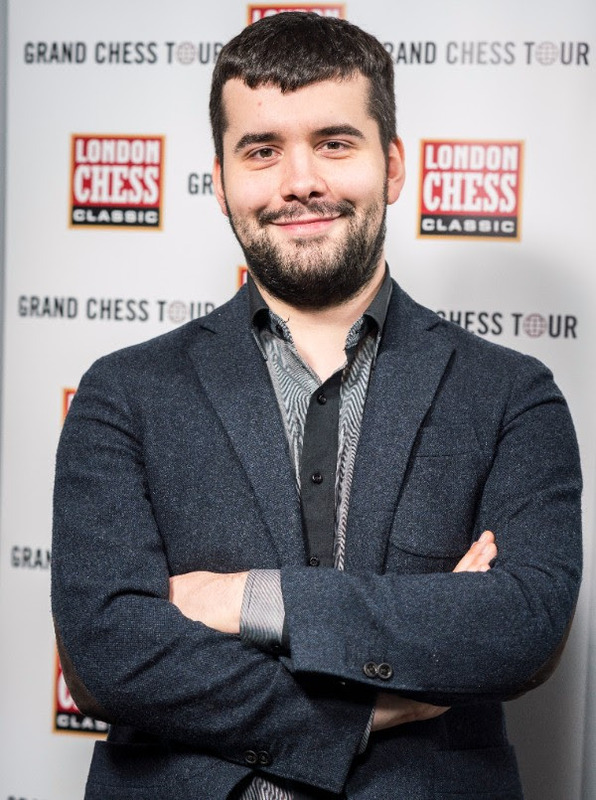 A win for Vachier-Lagrave would have meant tying for first in London with Nepomniachtchi and tying for first or even winning the entire tour outright. Unfortunately, he had the black pieces and his opponent gave him no chances to sharpen the position. As he explained, in every opening he plays there is a possibility for White to make an easy draw and he did not feel as though he needed to take unnecessary risks. 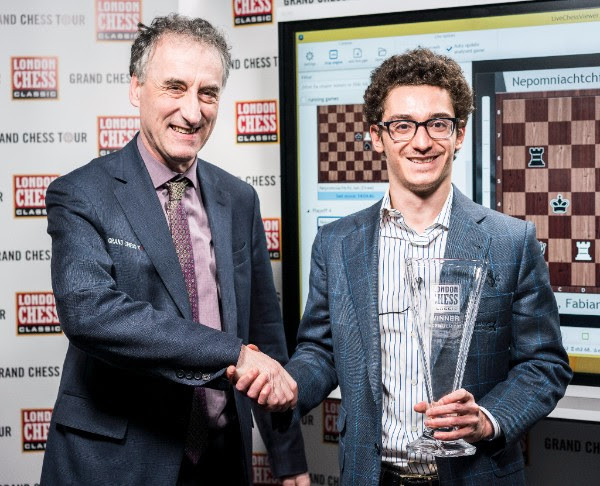 Caruana’s six hour effort paid off as his clutch victory allowed him to tie for first with Nepomniachtchi and go into the playoffs. After Adams placed his rook on an awkward square, Caruana temporarily sacrificed an exchanged to go into a winning queen and rook endgame. Once they players entered the fifth hour of play, Caruana’s technique became flawed which allowed his opponent to escape the potential mating net and enter a rook ending. A fatal mistake on move 57 allowed the American to enter a winning position, which he converted effortlessly. 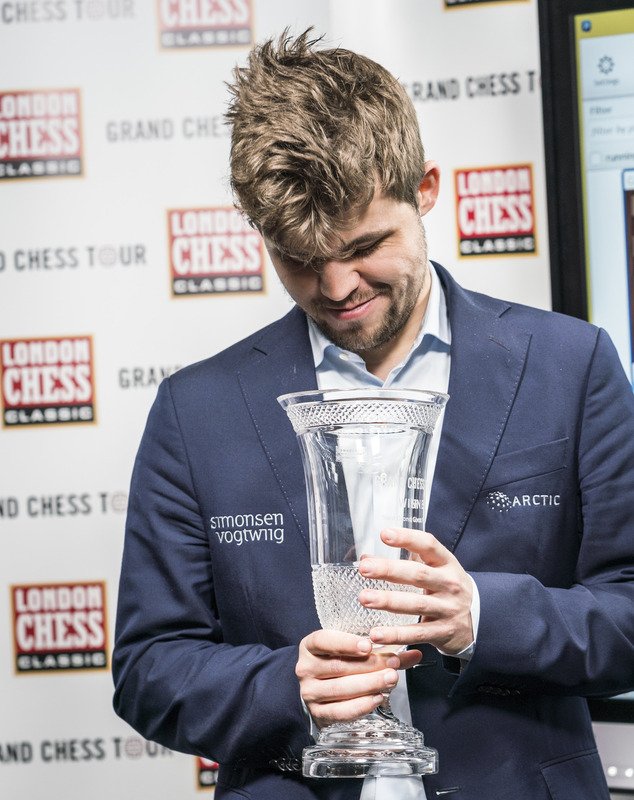 After Vachier-Lagrave drew his game quickly, Carlsen only needed to draw to win the Grand Chess Tour. Yesterday, before even looking at the standings, he was under the impression that he needed to win; learning the standings and the possible scenarios did not change his mindset. He missed Aronian’s opening idea and found himself in a very bad position. Carlsen thought that Aronian felt frustrated because he couldn’t find a win and overpressed instead of going for a draw. Aronian overlooked a defensive move by his opponent, giving the advantage to his opponent. Carlsen converted easily and went on to win the game, thus winning the overall championship of the 2017 Grand Chess Tour. 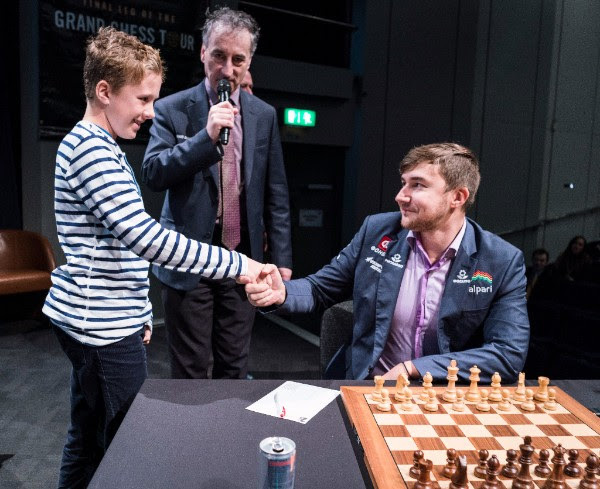 After eight draws, the American finally scored a win to finish the tournament with a plus score and gave his opponent a very unpleasant gift for his 48th birthday. Anand was on the White side of Giuoco Piano today but did not achieve anything out of the opening. After spending significant time working out the details of a tactic, So saw his opponent’s reply that would lead to equality but decided to play it nonetheless. 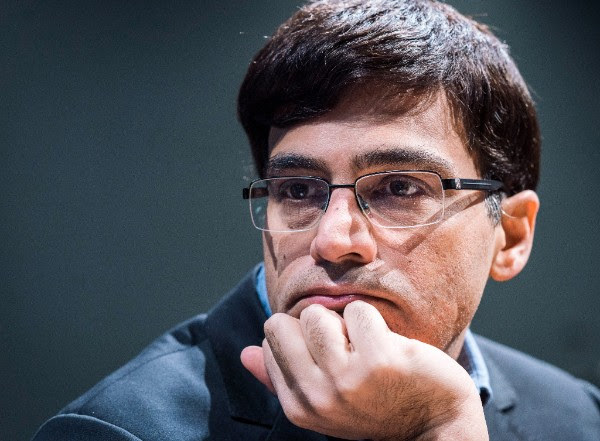 Anand erred, and his position collapsed immediately. It is very unusual for a dynamic player like Nakamura to not have any decisive result. He played ambitiously trying to complicate the position only to realize at the last minute that there was an error in his calculation. He chose a different route, but his position was already unpleasant. Karjakin also felt that his position was better but did not see a way to improve except for shuffling his pieces around. Draw was agreed on move 31.